1- Preheat oven to 400 degrees. Sauté red onion with 1 tbl of butter on medium low heat for 5-7 minutes or until soft, stirring occasionally. Meanwhile peel, core, and thinly slice the pear. 2- Sprinkle flour on a clean surface and roll out puff pastry to approx 9x12. Place on a baking sheet lined with parchment paper. Score a 1/3” edge on all four sides. Prick entire puff pastry with a fork. 3- Brush puff pastry with roasted garlic butter except edges. Then add red onions and a thin layer of pears and bacon. Finally top with all four cheeses and brush the sides with olive oil. 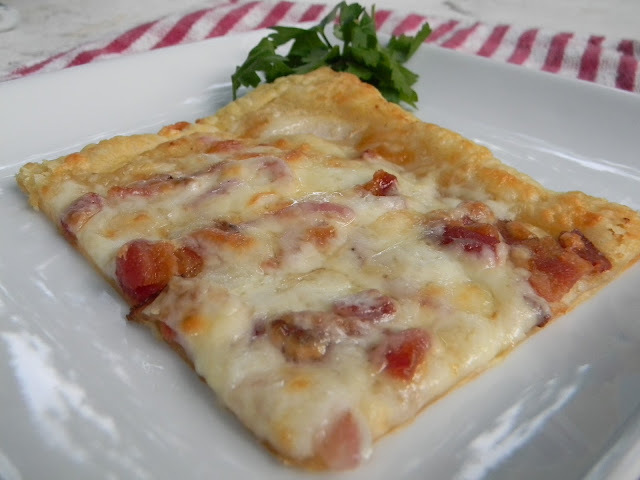 4- Bake for 15-20 minutes or until the cheese is melted and the bottom is nicely browned and crisp. Mmmmm...looks so good and I definitely want to try the roasted garlic butter.